← Old Miners, New Events – Old Miners Days and More! A room with a view…of the lake. 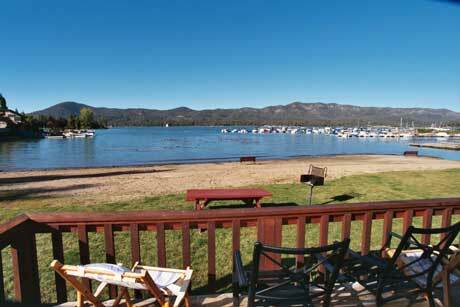 Here at Big Bear Frontier, our cabins and hotels sit right on the edge of Big Bear Lake. We even have our own little stretch of private beach for our guests to enjoy, making things like Fourth of July Weekend or a fishing trip with the family a perfect time to come and visit our happy resort. While the mountains get all the love during the winter months, the summer belongs to the lake. The warm waters are inviting for a number of activities, from lounging with the waves lapping at your feet to soaring above it on a jet of water or with a sail strapped to your back. Where do you begin? The family will have a blast when you bring them here for some beach time. Swim Beach, a popular attraction with a little something for everyone, offers a snack bar, picnic areas, slides, and other platforms to play with in the middle of the lake. It is not open yet, but it will be swamped once the area has been opened. Just a mile and a half away is Pleasure Point Marina, where you and the family can go out for a pedal boat ride or rent a boat for fishing and general floating around on the water. Renting your own boat for the weekend can give you all the time you’ll need to explore the lake on your own, but there are also options for a guided tour of the diverse and historic lake. 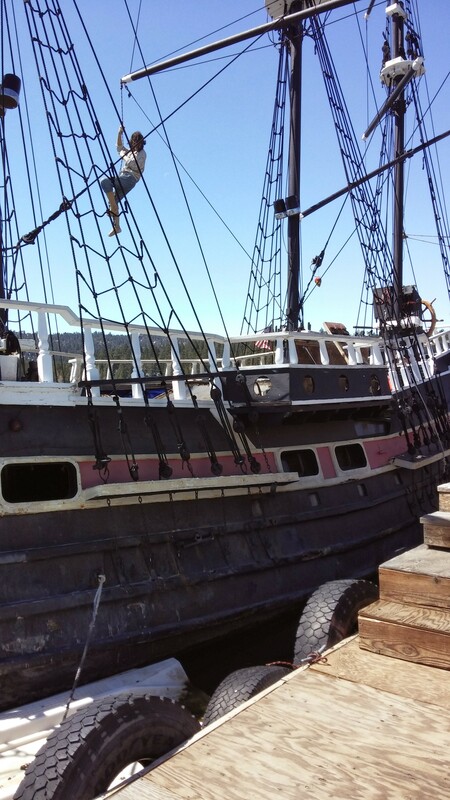 Once a movie star, this scale pirate ship can take you on a tour of the lake! There are a few tours on the lake where you can just sit back and enjoy all of the wonderful views of the mountains, the clear skies, and listen to the history of the lake. Miss Liberty hails from Pine Knot Marina, offering tours all summer and well into the fall including a spooky Halloween cruise. They’ll also be having a Fourth of July fireworks viewing tour, because floating on the lake while the sky lights up in colored sparkles is the best way to experience it. The Big Bear Queen paddles out of Big Bear Marina three times a day, with another cruise around the lake as the sun settles behind the mountains. It is a leisurely, intimate, and informative tour of the lake. There are some people who want to cruise around the lake in old school luxury, and Holloway’s Marina has that covered for you. And by old school luxury, they mean a pirate ship. The ship itself was used in the movie “Time Bandit”, used as a private residence, and is currently being used as a memorable way to cruise around the lake. And no pesky walking the plank or boarding other ships! Now that all of the exploration and splashing around in the lake is over, we can get to some sports! Fishing is always a popular activity in the lake. There are many tournaments you can participate in, the biggest one being Aaron’s Big Bear Bass Tournament happening all summer long with a championship scheduled for the end of September. The lake is also stocked with trout and filled with crappie to catch. However, if speed and adventure is what you are looking for, sitting in a boat trying to catch fish might be too slow for some of you. There are jet skis to rent and wakeboards to ride at all of the area marinas. You can go parasailing at Pine Knot Marina, getting views of the lake from hundreds of feet in the air. There is also the tens of feet in the air option through Action Aqua Flight, but it allows you to fly pretty quickly along the surface of the lake. That is a busy lake. And most of it will end around Labor Day, when the days are shorter and the lake starts to get a little colder. Sure, there will still be some boating and fishing in the fall, but there will be even more hiking, biking, shopping, and waiting for snow to cover the mountains and temperatures to drop. Getting close to the lake for all of your activities is easily achieved: reserve your cabin or hotel room now! Summer has just begun. Time to dive into all of the action Big Bear Lake has to offer! Gallery | This entry was posted in What to see and do and tagged aqua flight, Big Bear CA, Big Bear Queen, fishing, Fourth of July, Miss Liberty, paddle boat, summer, Swim Beach, swimming. Bookmark the permalink.